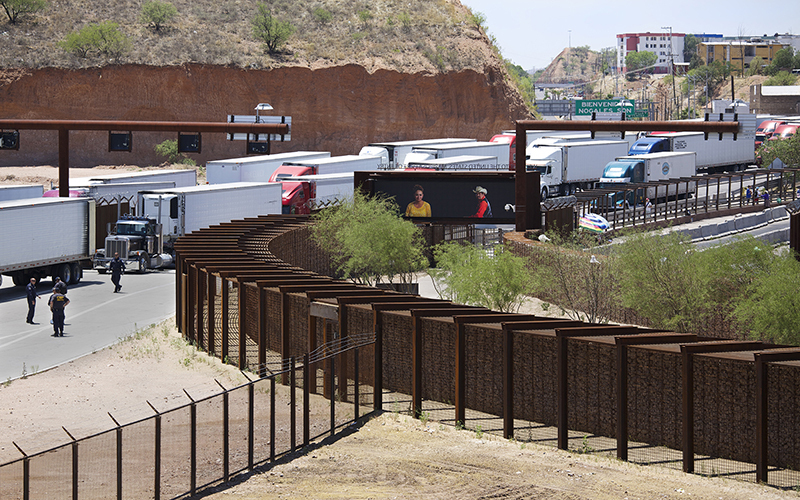 WASHINGTON – Ports of entry at Nogales are as many as 300 U.S. Customs and Border Protection officers shy of their approved staffing levels, according to the officers’ union, leading to long lines that threaten the region’s economy. Customs and Border Protection officials refused to discuss specific numbers of officers at Nogales, citing security reasons. But they acknowledged that there is a shortage at Nogales that the agency has started addressing by bringing in officers from other ports around the country on 90-day rotations. The National Treasury Employees Union said this month that as many as 175 officers have been brought in to Nogales for temporary duty, a policy that it says leaves ports short-handed elsewhere. CBP said the number of TDYs, or temporary duty assignments, is only 35. But everyone seems to agree that a long-term solution is needed. “You pay or you pay,” said Erik Lee, executive director of the North American Research Partnership. He said that if the government does not pay now to fully staff the ports, it will pay later through economic consequences, as traffic and trade through those ports are slowed. The Arizona-Mexico Commission said that Arizona had $8.3 billion in exports to Mexico in 2016 and $7.4 billion in imports from south of the border, economic activity that is responsible for about 90,000 jobs in the state. The Census Bureau reported that $2 billion worth of fresh vegetables moved through Nogales in 2016, making it the No. 1 port of entry for fresh vegetables coming to the U.S. from Mexico. Nogales trails the Texas ports of Hidalgo and Laredo in the importation of fruits and nuts, but still retains the No. 2 position for overall fresh produce traffic. Lance Jungmeyer, president of the Fresh Produce Association of the Americas, said anything that threatens the flow of goods through the ports is bad for his industry. “Customs functions are an integral part of the border community and border economy and if you allow customs to languish it hurts the … economy,” Jungmeyer said. Produce isn’t the only thing moving through Nogales, however, and delays in getting people across the border can hit the local economy hard. Olivia Ainza-Kramer, president and CEO of the Nogales-Santa Cruz Chamber of Commerce, said that wait times for travelers looking to cross the border during the last holiday season were as long as two hours. “We are very concerned our waiting times are so long people would rather not come,” Ainza-Kramer said. Nogales saw a decrease in border traffic this year that Ainza-Kramer attributed to the shortage of customs officers. “One of the biggest factors to why we are losing traffic coming to Arizona, they were looking to … another port to do their traveling,” she said. Pima County International Projects Coordinator Teresa Bravo said the region depends on Mexican tourists for business, but that their impact can be felt beyond the border. Long border lines are “impacting the entire state,” she said. Many of those challenges are systemic. NTEU President Anthony Reardon said in congressional testimony this month that CBP is burdened by a lengthy and involved hiring process, stringent polygraph testing and long training time that makes it hard to fill vacancies. He said that it typically takes 12 to 18 months for an applicant to be approved, a lag that he said has left the agency with 3,700 vacant positions. Jungmeyer said the staffing shortages at Nogales have given the CBP a chance to think outside the box, pointing to the port’s implementation in 2016 of the Unified Cargo Processing program. It allows Mexican and American customs agents to work side by side when inspecting cargo shipments crossing the border, instead of having each nation individually inspect the trucks on its side of the border. The CBP said the Unified Cargo Processing program has cut down wait times in Nogales by nearly three hours. Reardon in his testimony cited a study that said hiring 33 CBP officers leads to the creation of 1,000 private-sector jobs. The University of Southern California study said those private-sector jobs can result in a $61.8 million increase in the gross domestic product. Lee said there are other, less obvious impacts to delays at the border, pointing to a study he is involved in that is looking to see if air quality in the region is affected by trucks idling for hours as they wait to clear the border. “I think the border communities when you have long borderlines it affects quality of life,” Lee said.